Well, I've been busy traveling again; this time I took a brief jaunt to Central New York visiting my mom and family. School starts up next week, and I needed a little time swimming and sunbathing on Owasco Lake to really call it a summer. Unfortunately, the Milt did not join me because the 25-hour road trip last year nearly killed me. What was the boy to do? 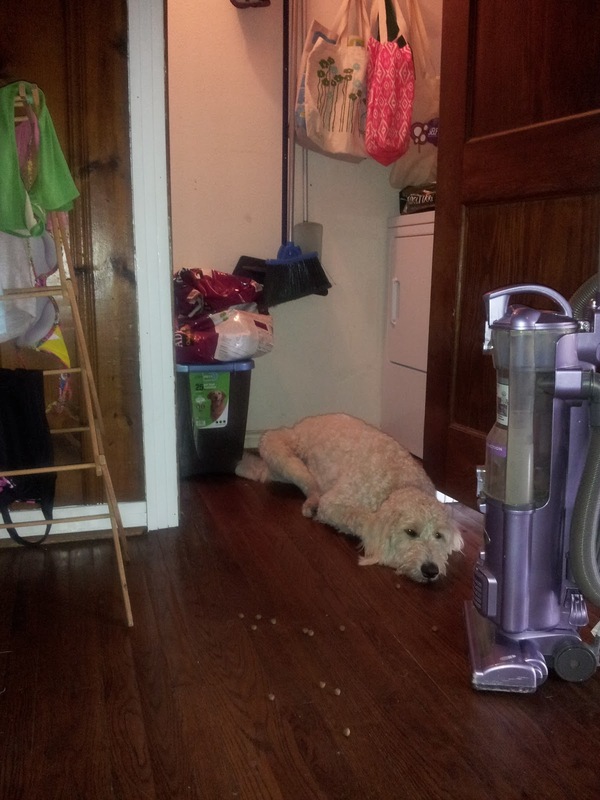 Our goldendoodle stayed home with his Daddy Dog. Just to make one thing clear, I am the primary caretaker of our pup. Jeff helps as best he can, but I'm Milton's Momma. One might go so far as to say, "Dads are for fun, and Moms get it done." Jeff prefers to teach tricks and play tennis ball with the Milt, fun but not imperative pastimes, while I am more concerned with walking Milt twice daily, purchasing his heart worm pill, and assuring he does not run out of canned pumpkin for his treats. My husband and I have very different priorities. My confidence with Jeff's fathering capabilities is generally strong, but the night before I flew out, he rattled my assurance just a tinge. Picture this: I am sitting in the dining room working away on my laptop. Jeff is reclining in the living room playing an all-consuming video game while Milton busies himself playing on the rug. I suddenly hear an annoying rustling noise, coming from the living room, that sounds strangely similar to a candy bar wrapper. Of course, I go back to my work because Jeff is in there with Milt under his watch. Once again I hear the same irritating noise, and I hop up to investigate. Mister Milton is sprawled out on the living room rug, very close to Jeff's inclined feet, munching on a chocolate protein bar wrapper. Hmm. Jeff was oblivious while my boy could have been poisoned. No, no. My confidence in my husband is faltering. Upon taking said wrapper away, Milt immediately lumbers over to Jeff's briefcase, carelessly strewn on the floor, and he pokes his head back in again to see what else he can find. Jeff acknowledges that there was probably only about a quarter left of that bar when Milton got to it. Nothing to worry about... Yes. My confidence in Jeff's parenting skills was ever so slightly destroyed. Thankfully, after my four-day stint away, I am back in Dallas, and all is well now. It was quite obvious that Milton missed his Momma as I was covered in kisses on the drive home from the airport. Now, our goldendoodle does not want to let me out of his sight. This includes nestling next to my feet in a tiny laundry room next to the hot, hot dryer while I tend to our clothes. Spending quality time with Momma - Milt might be slightly wistful wondering why all of my swimsuits are on the drying rack when he hadn't swam with me once. I am not quite certain what went on while I was away, but so far, despite Jeff's lack of doggie care skills, Milt appears to be happy and healthy. Thank goodness. On that note, I think it is simply best if Milt joins me in New York next summer. Oh no! I fully agree.